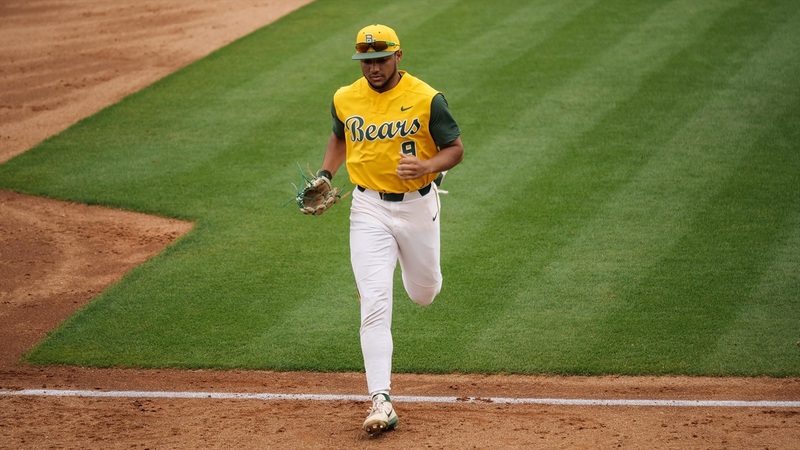 WACO, Texas – The Bears took down in-state rival and No. 8-ranked Texas Friday night with a 6-5 walk-off win at Baylor Ballpark, their fourth walk-off win and 14th come-from-behind win of the season. Davion Downey provided the heroics, slashing a line drive past a five-man Longhorns infield to drive home Richard Cunningham for the game’s winning run. Baylor (22-8, 6-1) had eight starters tally at least one hit and six different players score a run. Texas (20-13, 3-4) opened the scoring with a four-run second inning, but the Bears answered back in the bottom of the third with a four-spot to tie the score. Davis Wendzel drove in the Bears’ first run with a single, Downey was hit by a pitch with the bases loaded to score the second, and Cole Haring knocked in a pair to cap off the rally. In the fifth, the Bears made use of three consecutive hits from Andy Thomas, Shea Langeliers and Downey to score a run and go ahead 5-4. Jimmy Winston gave the Bears 5.2 innings of work, allowing four runs on six hits before turning the ball over to Ryan Leckich, who recorded a huge strikeout with the bases loaded to escape a jam in the sixth. The Longhorns got one back off Leckich in the seventh, but Josh Bissonette and Nick Loftin teamed up to turn a smooth double play and keep the score even at 5-5. Texas had the bases loaded again in the eighth, but Baylor turned a 5-2-3 double play on the first pitch that reliever Luke Boyd threw to get out of the inning. In the ninth, Cunningham bunted to beat the shift and give the Bears a leadoff baserunner. Wendzel and Thomas followed with back-to-back walks before Langeliers popped out to right field. With one away, Downey came through with the game-winning knock, a scorching line drive past the Texas first baseman. Boyd (3-0) earned the win to keep his perfect record intact, while Longhorn reliever Matt Whelan (2-1) was tagged with the loss. *This was Baylor’s fourth walk-off win of the season and 14th come-from-behind victory of the year. *The game against No. 8 Texas was Baylor’s first game against a ranked opponent this season. *The win is Baylor’s first win against a ranked opponent since May 13, 2018 against Oklahoma State and highest-ranked win since defeating No. 8 Texas Tech on March 17, 2018. *The win snaps Baylor’s four-game losing streak against UT that dates back to 2017. *Baylor is 6-1 to start to Big 12 conference play, its best mark under since 2012 when the team won its first 18 conference games. 6-1 is the Bears’ best start to conference play under fourth-year head coach Steve Rodriguez. *The Bears are now 5-6 vs. Texas in the Rodriguez era. *Since inserting Nick Loftin in the leadoff spot on March 10, the Bears have scored 117 runs on 180 hits in their last 16 games. Loftin is 28-for-67 with 5 HR, 18 RBI and 19 runs scored during the stretch. The Bears are 13-3 in such games. *3 of the Bears’ 6 runs were scored with two outs, moving their season total to 109 of 216 that have scored with two outs. *The Bears are 6-2 in weekend series-openers. *Cole Haring picked up his seventh multi-RBI game of the season, tying him for the team lead. He now has 26 RBI for the year, also tying him for the team’s best. *Davion Downey collected his sixth multi-RBI game of the season with three. *Nick Loftin extended his season-long on-base streak to 16 games and his team-leading hitting streak to 11 games. *Davis Wendzel extended his on-base streak to 10 games with his 13th multi-hit game of the season. *Chase Wehsener has a seven-game hitting streak. *Ryan Leckich made his team-leading 16th appearance of the season. *Luke Boyd pitched a hitless 1.2 innings and earned his third win of the season. 3 – Davion Downey drove in three runs, including the game-winner. "It was a great college, Friday night baseball game and that is what I really liked about it. We made some mistakes and they made some mistakes, but the big thing was that our guys persevered. This is what Big 12 baseball is all about because sometimes it is going to come down to the last inning and last out and I am really happy our guys were able to come out on top." Game two between the Bears and the Longhorns is scheduled for Saturday at 3:05 p.m.